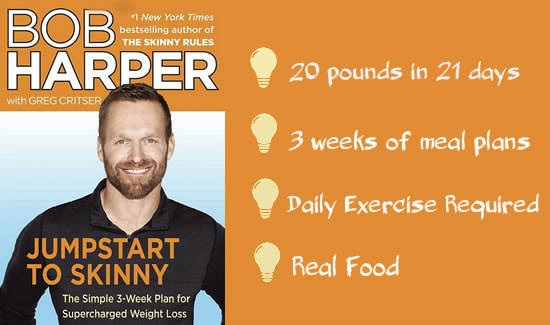 Jumpstart to Skinny is a popular book and a quick weight loss plan from The Biggest Loser trainer, Bob Harper. He says that dieters can lose up to 20 pounds in 21 days, but is almost a pound a day weight loss realistic? Harper says that this Jumpstart plan should only be used for 3 weeks as a way to accelerate weight loss, especially helpful before special events like weddings, beach vacations, etc. The plan revolves around 13 simple rules that dieters must follow if they expect to lose 20 pounds in 21 days. Bob Harper says that these rules are some of his insider celebrity secrets that he uses with his celebrity clients to get them ready for red carpet events and now everyone can benefit from these “secrets” as well. These rules should be adhered to throughout the entire three-week program. Consume the proper proportions: 40 percent protein, 40 percent carbs and 20 percent fat. Cut back on calories. Women are allowed 800 calories per day and men can have 1200 calories. Don’t eat complex carbohydrates after breakfast. Do 45 minutes of aerobic exercise a day before breakfast. Five times a week do 15-20 minutes of Bob’s Jumpstart Moves. Eat unlimited amounts of the recommended vegetables. Eliminate fruit during week three. Have one to three espressos a day as a way to rev up the metabolism and perform better during exercise. Harper describes espresso as the “perfect caffeine delivery system” because it doesn’t promote jitters and is calorie free. He says to drink it black and have several throughout the day. Calories are very low, which may cause fatigue, hunger and a risk of nutritional deficiency. However, Harper reminds readers that the program was designed as a short-term approach for achieving rapid weight loss. At the end of the three weeks, you should switch to a more sustainable healthy eating plan. This type of philosophy contributes to unhealthy yoyo dieting instead of losing weight gradually and keeping it off by changing one’s lifestyle and unhealthy relationship with food. Jumpstart to Skinny is available from Amazon here. Very funny how no one else has clocked that “Ben” is most definitely “Bob”! Continuation from the last post…. Here’s something to think about for calories…. my dad uses MFP to track his daily calories. He is only allowed to have 1200 calories a day, and if you compare it to Bobs plan, it’s the exact same amount of calories… only difference is Bobs plan is more strict…. and if he wanted to, my dad could eat more than 1200 calories as long as the extras were all veggies…. Guys…. reading all these comments just makes me shake my head. Bob’s book is about a 3 week plan that’ll help you lose UP TO 20 lbs to jumpstart weight loss or get you ready for a special event. It’s not meant to be followed over a long period of time. Yes, when you think about it, the calories seem lower than what you think you need to eat, but isn’t this the reason you’re interested in the book? Because you’ve over indulged? Also, Bob recommending a “workout” before breakfast is completely normal. It’s called fasted cardio, and it’s meant to help the weight loss process speed up and increase your metabolism. I just ordered the book and can’t wait to get it. I looked over the meal plans and you know what… it’s going to be tough not eating all the “extras” that I have on a daily basis, and I’ll probably want to give up, but 3 weeks of restricted eating isn’t going to kill me. My body probably needs to detox anyways from all the garbage I put into it lol. Long story short, get the book and try the diet for 3 weeks. There’s unlimited veggies so you won’t starve. You might not like what you’re eating, or you might get sick of the food, but it’s not for forever. It takes 21 days to break a habit, so after these 3 weeks I guarantee you won’t be craving sugar, but you will be craving healthy food. After my 21 days I’ll post back here and tell you about my progress. It’s not going to be easy, but it’ll be worth it. Good luck everyone! I have tried this diet and it’s not a life change it’s a quick way to shrink your stomach so you eat less. I loved it and the quick results! After the 2 weeks my stomach had shrunk and I began to incorporate other foods back in to the meal plan and it helped me to get back to eating healthy again. I did not feel cheated or deprived of anything! Like it says its a jump start not a life plan! 20 pounds in 21 days diet plan!! Only 40 percent carbs a day?! This is so ridiculous! Our bodies thrive on glucose for energy. No wonder you need all those espressos. Even if you ate the 800 calories PLUS 500 calories of vegetables per day, that’s way under eating. I’m a little shocked Bob is promoting this. Hi. I bought jumpstartvto to skinny on audible and I obviously need the menu and exercise program. How do I get this.? The 800 calories (for women) and 1200 calories (for men) is BEFORE you add all the vegetables and fruit (although no fruit in week 3 and by then your body is not really craving them if you have been following the guidelines completely – I speak from experience – I’m a 6’3″ male and I had no problem sticking to the rules!). The book recommends eating lots of vegetables and fruit (apples and more), throughout the first 2 weeks (no fruit in week 3) and they don’t count towards your daily intake. That is a very big distinction! I have done this successfully and had no problem adjusting to it (with a good chunk of determination, of course – as with any other change in habit). You could have at least chosen a name with double syllables and not starting with a B.
Interestingly, I have a diabetic cookbook that has wonderful meal plans and recipes for these meals that are between 550 to 750 calories. I would think these could be used to loose that weight! I don’t think any doctor out there would recommend that you eat anywhere near 750 calories if you’re trying to lose weight!! The recommended daily intake for women (depending an height, activity level and age) are definitely less than 2000 calories per day if you intention is to lose weight (that’s included ALL vegetables, whereas Bob’s Jumpstart plan is 800 + all the vegetables you can possibly eat (from a large variety of vegetables that is easily 400-500 calories extra per day for you to enjoy – all his recipes back this up, you’ll see). I’m a week into this plan and have lost 5lbs. I only have 20lbs to lose, but I know some people have more & that may make it difficult. Volume-wise, it’s more food than I normally eat. For the concerns regarding it being so low calorie, my previous eating habits consisted of rarely having fruit, vegetables, or much water. What I did eat was a lot of carbs (love bread), lots of fat, some protein, and plenty of sugar. So, I think that 800 cal/daily of a healthy diet, the veggies, no salt, no sugar, no cal or sugar electrolyte drink, and plenty of water, is better than 1200 plus calories of junk. You can eat unlimited veggies (he lists 40 different ones). I feel a LOT better and have more energy. Also, the exercise before breakfast is walking at whatever pace you want (I only do 2.5 mph) for 45 mins. He says, “If you can’t talk easily while [walking], slow down. If you feel like going to sleep, go faster” The caffeine he says to limit to 2 cups of coffee per day, max, with no sugar or cream/milk/etc. And to be honest, I haven’t done the other exercises (20 mins) that he recommends. He doesn’t specify when to do those (that I remember), so I take it as you can do them whenever. He believes in exercising on an empty stomach? Really?!! The whole book just lost all credibility. Walking for 45 minutes at your own chosen pace ““If you can’t talk easily while [walking], slow down. If you feel like going to sleep, go faster” can hardly be considered real exercising, I’m sorry. It’s for a 3 week period – that is it!). There is no mention of rigorous exercise without food!! Actually, it’s called fasted cardio, and it forces your body to burn the glucose stores that your body has built up. It jumpstarts you metabolism and is more effective. Do some research before dogging the book. Nah. I get up at 6:00 am for a morning run and there’s no way I’d put food in my belly before then. Sounds downright scary to me. Everyone these days seems to think they are an expert in nutrition. I’ll say No thanks, to this book. I’ve been staying lean, with great focus and tons of energy, with the Zone and I plan to keep it that way. If you are at a good weight why are you reading this? There is no way, eating 800 calories a day is healthy, I like this dude but he needs to stick to exercising. I’m with Ben on this. I have actually used Bob’s Jumpstart to Skinny for several years before our cruise vacation in February. I only have about 10 pounds I like to lose, but it is effective in doing that. The volume you eat on this jumpstart diet is plenty to sustain you. Bob also cites research that shows a low-calorie diet can actually change your metabolism and help you keep off the weight after you transition to the Skinny Rules. MANY dietitians will recommend the 40/40/20 proportions. There are also studies that promote working out on an empty stomach, so it’s not like Bob is way out in left field. It definitely takes dedication, but it is a great way to jumpstart a healthy-eating lifestyle. I completely agree with you. This seems like another unhealthy, crash diet that’s probably going to do more harm than good in the long run, as it promotes a yo-yo weight rather than healthy, stable living. Wow. Not surprising there is yet another one of these, but sad it comes from such a big name. Hence, it should only be done for 3 weeks. But the plan is still terrible. I think it’s pretty well established that lots of cardio and large calorie deficits are a bad combination, even for a short periiod of time. Do weight training only, eat lots of lean protein and cruciferous veggies while maintaing a large calorie deficit for just a few weeks and you’ll lose more weight, preserve more lean body mass and feel better. I heard him speak on the Today Show clips on the internet. I guess one thing that does soften the suffering of his diet is that non starchy vegetables don’t count towards the 800 or 1200 calories. So presumably, a person could eat a whole pound of broccoli or spinach each day. However, a person needs to eat some fat to absorb all the carotenoids from these vegetables. It is hard to eat much fat on so few calories. I lost my weight never consuming fewer than 2000 calories a day and at this level it was pretty fast, although not 20 pounds in 3 weeks, but rather about 6-8. I was exercising everyday. I would tend to think that very low calorie diets are not that healthy and can lead to weight regain, since it puts the body into famine mode, which makes it store fat more readily. Very seldom are such diets nutritionally complete, either. Great news: You can have as many non starchy vegetables as you want on this diet, Dan and you’re quite right they don’t count towards your 1200 calories per day on this Jumstart diet)! It sounds like your diet is already working for you so there’s no need for you to ‘Jumpstart’ again since you are already losing the weight. If you wanted to follow Bob’s everyday diet recommendations you are better off with his Skinny Rules and NOT Jumpstart to Skinny (it is only meant as a 3 week Jumpstart program and then you transition to the Skinny Rules that are a lot less restrictive). Ben, so glad to see your responses here. They’ve helped me tremendously. I’m promoting a three diet program myself and received some criticism on these sorts of diets, but I also read and researched tons of other information that many of these diets work and are not harmful in most instances, but, as you mentioned, they are not for long-term use. Thanks Ben! I would DIE on 800 calories a day. That’s like, starvation-level caloric intake. Sure, you may lose 20 lbs in 21 days, but as soon as you eat normally again, you’ll gain at least 5 lbs of it back. I wouldn’t try this plan either. He says espresso doesn’t promote jitters? And on a low-fat diet? He doesn’t know what he’s talking about. Espresso and low-fat diets both promote jitters. That’s why everyone was like that in the late 80s/early 90s. Couldn’t agree more. I used to be a Starbucks Barista and we’d do espesso shots before starting our shift. Just two of those is enough to make you jittery. On days I did four, I was a wreck!